It's cheap-you can get a massive cabbage that can supply 4+ meals for less than a dollar/pound. It's pretty darn healthy. I list some of the benefits of this cruciferous vegetable below. It's so versatile. There's a reason this post is titled "Cabbage: 11 ways" It can be transformed into anything from a decadent comfort food to a simple slaw or add some crunch and a boost of nutrients to any salad. To learn more about the benefits of cabbage you can read Dr. Mercola's article here. 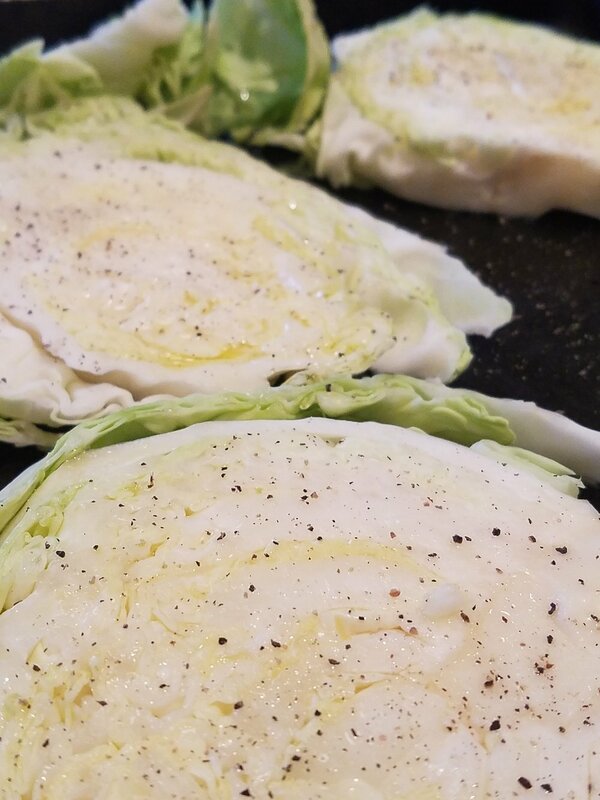 1) Roasted cabbage steaks or wedges-Slice cabbage into thick slices or wedges, drizzle with oil and season with salt and pepper or any other "steak" spices. Roast in the oven and enjoy! I sometimes make a honey mustard sauce and dip it...I'm weird. 2) Cabbage Stir Fry-Whether you're having cauliflower fried rice or just a vegetable stir fry don't forget to throw in some shredded cabbage into the mix for a nutrient boost and a crunch. 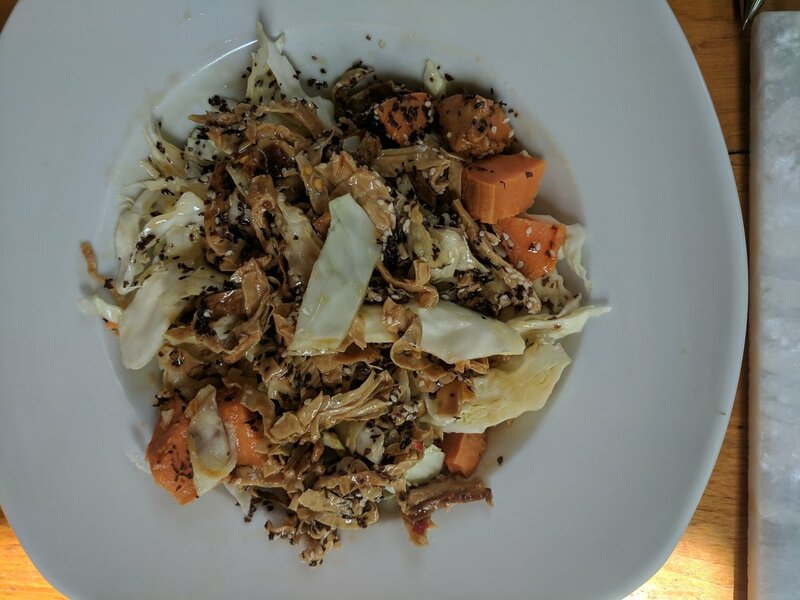 3) Cabbage Salad-You can top a regular romaine salad with some cabbage or I like to dice up cabbage and add some yuba noodles and sesame seeds with a little miso dressing for a fabulous cabbage salad. Below is what I throw together and it is pretty tasty. 4) Cabbage Pasta-Ok I know it sounds like a stretch, but hear me out...When you sauté up a bunch of cabbage it kind of has the consistency and texture of pasta and it holds sauces. It's great for a spring primavera pasta substitute or add some red sauce. In the Spring I went off of this Oh She Glows Recipe and instead of shredded carrots I used cooked cabbage and it was divine. 7) Cabbage coleslaw-The most obvious and kind of basic, but sure is tasty and can make a great accompaniment to any bbq dishes plus it keeps the cabbage raw and if you don't load it with sugar can be a healthy side dish. 9) Roasted Cabbage Veggie bowls (Buddha Bowl) Who doesn't love a rainbow of roasted veggies? 10) Ethiopian cabbage-If you haven't been to an authentic Ethiopian restaurant you need to get on it! My favorite is Muzita in San Diego that makes authentic, organic and vegan Ethiopian. One of my favorite parts of the dish is the cabbage!! 11) Last, but not least we can't forget FERMENTED CABBAGE-saurkraut and kimchi are excellent additions to salads, sandwiches and sides. This is the most healthy way to consume cabbage because you get all of the benefits of raw cabbage, minus the compounds that can be hard on digestion and get a bonus of probiotics and healthy bacteria from the fermentation process. It's a win-win-win! So are you going to pick up a head of organic cabbage the next time you are at the grocery store or farmer's market? What are your weird veggie cravings?